Medium bodied and great viscosity in the mid-palate create a dry and refreshing wine. 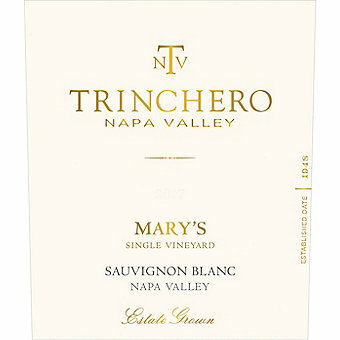 Located in the warm Calistoga AVA, Mary's was the very first vineyard purchased by the Trinchero family, and holds significant sentimental value. Named to honor Mario's wife, Mary's Vineyard has aged very gracefully, with balanced vines, moderately fertile soils and excellent sun exposure-ideal conditions to grow Sauvignon Blanc with a tropical character. This wine is fermented and aged in stainless steel for about 5 months. Winemaker Mario Monticelli says "It is unmistakably Sauvignon Blanc with aromas of melon, orange blossom and subtle mineral components, boasting beautiful complexity and hints of pineapple, passion fruit and juicy mango flavors. Medium bodied and great viscosity in the mid-palate create a dry and refreshing wine followed by a crisp and well-balanced finish."